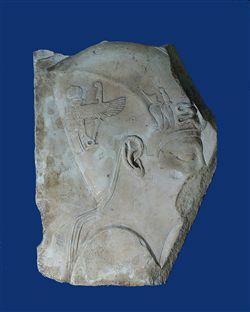 On a small slab of limestone, the head of a king is depicted in high relief. Nose and mouth are broken off. A part of the right shoulder is visible. The rendering of the shoulder suggests that a king's bust is represented. The king wears the blue khepresh-crown, of which the head of the uraeus on the front and a small part of the helmet itself are missing. On the side of the helmet are two more uraei, one wearing the white crown and one wearing the red crown. At the back of the crown, Re-Harakhty is represented with outspread wings and crowned with a sun disk. He stands on a shen-ring on which is also a sceptre, which continues behind his wing. Under the wing, the sceptre has the shape of a papyrus stem (uadj, Gardiner M13), above, it has the shape of a ma'at-feather. A stylized ribbon hangs down from the back of the crown. The relief is finely carved; the smaller details a little irregular. The piece is most likely a sculptor's model or a votive plaque.